Become the best waitress in the galaxy. Star Wars: Cantina is a combination of George Lucas' celebrated universe and the award winning Diner Dash. In it, you play Nia Adea, a hot gal who agrees to help her friend Robb the Besalisk pay off debt by working in his cantina, Thirsty Bantha, located in the Mos Entha space port. To achieve this goal, she slaps on the apron and serves drinks to some of the most impatient customers in the galaxy. It's a cute little game that, while a bit short, should keep you entertained for a couple of hours. Aside from the Star Wars inspired visuals and audio, the game plays like Diner Dash. You'll seat a variety of customers, take their orders, deliver drinks to their tables, collect tips and then remove the dirty glasses. Except instead of showing old ladies and kids to their seats, your clientele includes jawas, moisture farmers, smugglers, rodian bounty hunters and stormtroopers, all of which have their own quirks that make the game difficult. You'll breeze through the first couple of levels because you only have a couple of tables. Later, you'll need to tap into your multitasking skills to bus four or more tables, running back and forth delivering drinks and dumping dirty cups into the sink. You must do everything quickly to avoid angry patrons from leaving. That, of course, is easier said than done, since gamorrean guards don't have much patience. Thankfully, you'll be able to upgrade the cantina with a small variety of different items, including a water cooler, air conditioner and potted plants, among other things. Each one buys you more time with a specific character, allowing you to focus more energy on others. As expected, everything works using the touch screen. Tapping a customer (or group) instructs him/them to take a seat, and you'll find out what drinks he/they want by tapping the respective table. Then you'll head to the bar, where Robb will leave the orders for pick-up (simply tap drinks to add them to Nia's tray). It all works well for the most part, though we had some trouble directing specific drinks to her tray because they're quite small on the iPhone's screen. Length is another issue. You'll finish Star Wars: Cantina in a couple of hours. That would be all right if it was relatively inexpensive, but THQ wants you to pony up five bucks. We certainly hope the company releases downloadable content in the future. 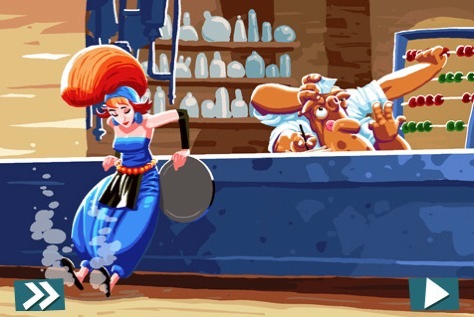 Of course, if you have the cash to burn and love Diner Dash and/or Star Wars, Cantina's a fun time management game. Casual players have seen this type of thing before, but THQ earns high marks for creating a new cast of characters fan boys can identify with. That said, if you're one of those stingy iPhone gamers, wait for a price drop. 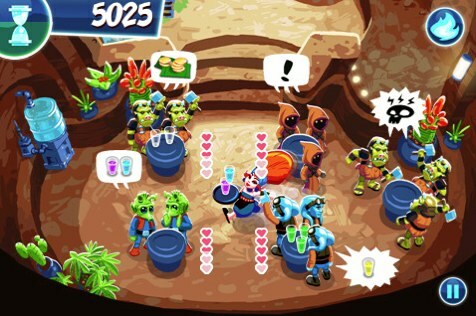 What's Hot: Cool Star Wars characters, cheery music, Diner Dash gameplay. What's Not: Small glasses, won't take long to beat, costs $4.99.